What additional things can we track? What new issues can we resolve with more code? How do we measure the latest campaign initiative? But maintenance is important. It allows us to head off problems before they catch fire. Regularly checking in also allows us the ability to be proactive about trends. This way, we are no longer reactively building our implementation and applying band-aid fixes. The important thing is stay on a schedule. You’ve heard the adage “Practice Makes Perfect” or the adjusted “Perfect Practice Makes Perfect.” It’s important to be consistently checking in to Google Analytics and checking that things are tracking properly, that your numbers are going in the right direction, and that you’re collecting the right data to make decisions. Not sure where to begin? We’ve helped to create a schedule to stay on track. While not necessarily exhaustive, it identifies several key recurring milestones to help us keep our implementation in peak running order. It also has built-in a method for routine reporting and trends analysis. We have broken out the Calendar into Weekly, Monthly, Quarterly, Semi-Yearly and Yearly Tasks. The tasks within the calendar are spread throughout the year so new day/month is overly front-loaded when those yearly tasks roll around. You can configure it to send an email reminder the day before the task is due. Below is a breakdown and summary of each one. They also include links to sample reports from the Google Merchandise Store Analytics Demo Account. You can gain access to their GA data here. Check conversions for any noticeable movement week over week. What channels/regions drove this movement? Communicate any changes to the necessary stakeholders. Look over the default reports for any anomalous activity. How many active users are on the site? How many pageviews from the last 30 minutes? How many conversions in the last 30 minutes? Check the monthly Bounce Rate compared to the prior month. What is the Bounce Rate for the month? What Channel had the highest bounce rate? What Channel had the greatest change (+ or -)? Review Change History for any undocumented/unknown activity. (You’ll need edit permissions at the account level to view). If found, confirm changes with stakeholders and place any necessary annotations. Check Monthly Conversions Compared to the same month the prior year. This is a big one. Allow yourself some time to complete. What was the percentage change? What was the goal with the most conversions? What is the Ecommerce Conversion rate? What was the Average Order Value? What was the product with the most revenue? Check and record your property hit volume from the past 30 days. Is this number over 10 million? Communicate this with any necessary stakeholders. Check the hostnames sending data to your property from the prior 90 days. Are there any unknown/unexpected hostnames? What percentage of pageviews are they accruing? Communicate with any stakeholders the development and assess the need to adjust any filters. Monitor Spam Traffic on your site in the past month. Any noticeable spikes in activity? What percentage of sessions match this segment? Is the ‘Exclude Known Bots & Spiders‘ box checked? Were there any 3rd party monitoring services added that need filtered? Are there any other movements to note? Check the Channels Report compared to the same quarter last year. What was the top channel? What Channel had the largest absolute change (of significance)? Doublecheck the other Google products that are linked with your GA property, like Google AdWords, etc. Are there any additional ones that need set up? What percentage of (not set) accounts do you see in your AdWords Accounts? Is Google Search Console Properly linked? Any additional integrations need configured (DFP, DBM, DCM, etc.)? Are there any additional groupings you could create/modify within the the ‘other’ channel from the last six months? Assess your Default Channel Groupings Configuration. Do they align with your business objectives? Check Six-Month Conversions compared to the same period the prior year. This is a big one. Allow yourself some time to complete. These tasks are broken out throughout the year bi-monthly. Check your site(s) for missing GA/GTM code. Spot check key portions of your site for code. User third party tools in necessary. Were there any code shifts, redesigns or additional content sections added to the site? Check for self referrals and analyze the referral path for insight into missing tracking code. Check the all pages reports as well as the event pages. Visually check event categories, actions and labels as well. Check Google Analytics Goals and Filters setup. Make sure the filters are applied in the correct order. Ensure Includes and Excludes are properly affixed. Are there any new filters that need to be added? Check and verify your Goals configuration. Are there any new Goals you should include? Do any goals need reevaluated? Check Google Analytics Custom Dimensions & Metrics setup. Check to see if you custom dimensions are properly scoped. Spot check their setup in the interface. Are there any new dimensions/metrics that need to be added. Are the events properly reporting within the interface? Do any adjustments need made? Are there any new events that need to be added? Check Google Analytics User Access Settings across all levels (Account, Property & View). Are there any users that need removed? Are there any users that need added? Do any permission levels need reassessed? Wait, What About Daily Events? 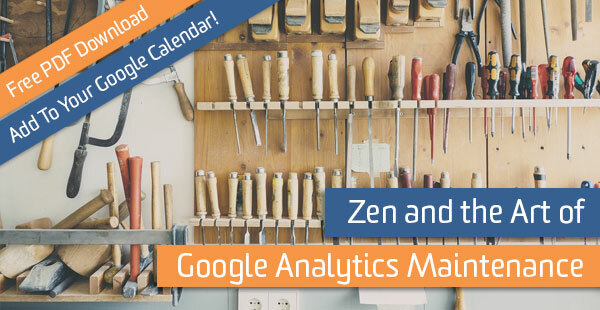 This holistic approach will help you keep tabs on and stay pro-active with your Google Analytics Properties. Let’s keep things nice and tidy!